Palm today said its ‘smallest and lightest smartphone yet’, the Palm Centro, will go on sale in the UK at the end of the month. 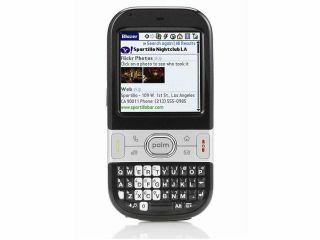 The Palm Centro resembles the Palm Treo 500, released last year, but is thinner and taller than its sibling. It also runs on Palm OS rather than Windows Mobile 6. The Palm Centro crams in a Qwerty micro keyboard, quad-band GSM/GPRS/Edge connectivity, but - just as with the iPhone - no 3G. The Centro's memory can be beefed up to 4GB thanks to the Micro SDHC card slot. There’s also a 240 x 320, 65,536-colour touchscreen, Bluetooth, and a 1.3-megapixel camera. You can connect to all your webmail accounts, Google Maps and so on using the integrated web browser. To complete the package, the Centro comes with the PocketTunes music player, Microsoft Office support, and push email. Available in black onyx, the Palm Centro will go on sale at the end of February, priced at £199.